This music book features 14 songs from the chart-topping CD OFFERINGS II by popular Southern-rock band Third Day. Suitable for piano, guitar and vocals. 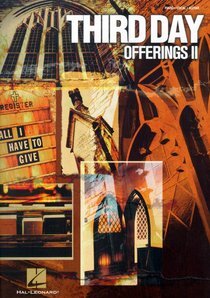 About "Offerings #02: All I Have to Give"
14 songs from the chart-topping 2003 release by this popular Christian band with a Southern rock sound. Includes: Anything * Creed * The Everlasting * Give * God of Wonders * May Your Wonders Never Cease * Nothing Compares * Offering * Show Me Your Glory * Sing a Song * Take My Life * Turn Your Eyes upon Jesus * You Are So Good to Me * Your Love Oh Lord.